The African Grey Parrot Centre  team are extremely passionate about the welfare of our feather friends. We want to ensure that all parrots have a stable, loving forever home. We understand there are times when parrots need to be rehomed because their owners circumstances change, therefore we want to offer a forever home rehoming service. 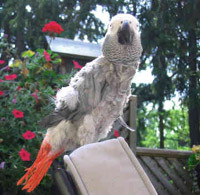 The African Grey Parrot Centre  needs suitable members that can provide a stable, loving forever home. Any parrots rehomed by us, will remain the property of the African Grey Parrot Centre . If any circumstances change with a rehomed parrot that can no longer be cared for, the parrot must be returned to the African Grey Parrot Centre . A monthly update regarding a rehomed parrot is required, along with a donation into our charity fund, as some parrots may require a veterinary check or tests. Some of the parrots that arrive in our care can suffer from emotional or psychological problems. These problems can be shown in many ways, through aggression, plucking, screaming, shyness and fear. Parrots can also live up to 75 years of age or more! Can you offer a forever home? Do you have experience with parrots? Are your aware that parrots are a lifelong commitment? Do you have the patience to cope with a parrots strong personality? Can you provide a stable, loving home? Can you give a parrot enough time and attention? Does your home have adequate space for a cage and for 4 or more hours out of cage time? Are you aware of a parrots dietary requirements and nutritional needs? Do you have the finances for lifelong veterinary fees? Are you able to ensure a suitable carer for holidays or travel? If you have answered YES to all of the above, are experienced, and can offer a lifelong commitment, please add yourself to the forever rehoming list. Please state the area that you are able to cover, and whether you are able to travel. The African Grey Parrot Centre  team will contact members listed in this section for further information when required. If you think you can help, please apply giving us as many details about you that will help us work out your suitability to be a forever home carer go to the rescue contact page and give us as much detail about yourself as possible.